RGCD are proud to present our very first 64KB cartridge with Albarbi's official conversion of The Mojon Twins' UWOL: Quest For Money. Originally released back in 2010, the C64 port of this superb little platformer has stood the test of time admirably and remains as enjoyable today as was on its initial release. With the ZX Spectrum game designer na_th_an on board, Algarbi rewriting the code and Conrad on soundtrack duties, UWOL's classic arcade design and addictive gameplay translated over to the C64 to create a game that's arguably better than the original - UWOL is more than deserving of it's respectable 8.9/10 score over at CSDB. This cartridge version by iAN COOG was actually created to test our new 64KB PCBs, but it proved to be so much fun that we just had to look into the possibility of publishing it with The Mojons' permission. After a few quick emails and deals signed and secured, the final release candidate arrived at RGCD HQ ready for production - and now you too can own a physical copy of this great C64 conversion and guide UWOL back through Storm Mansion's cellar labyrinth on his quest for money! 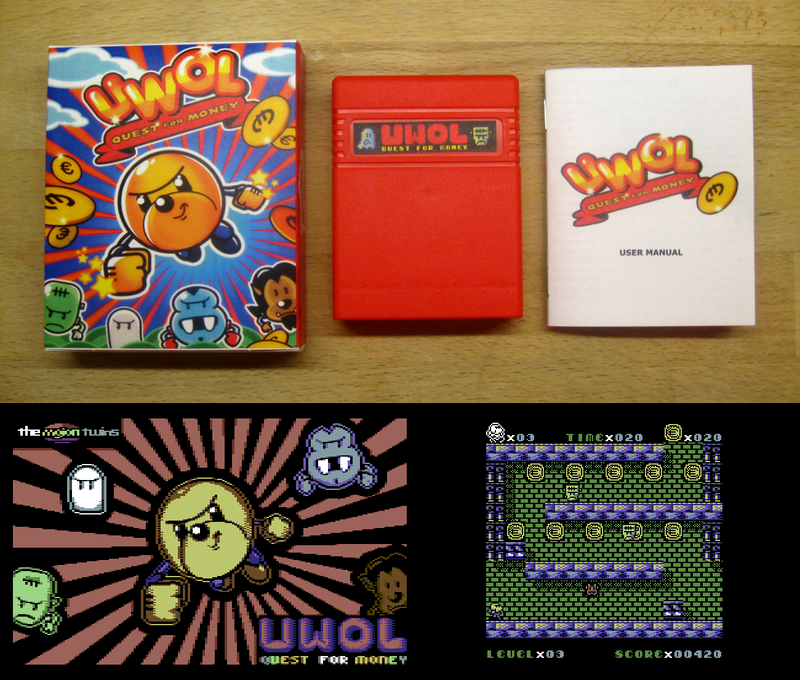 UWOL is both NTSC and PAL compatible, and it's joystick-only control means that it's even playable on the Commodore 64 GS console. The box was created using the promotional artwork by Ferrán Criado, and the game comes in a red cartridge shell complete with a printed manual. It's available to buy now from our online shop at a price of £24/25 (including European/Rest of World shipping).